It's only been a minute since you last saw me in this flannel - I can't stop wearing it (and lucky for you guys - it's on sale now!). Paired with my cream cable knit sweater and classic green Hunter Boots the effect is positively preppy - especially with my giant AP gobstopper pearls. Sometimes you just have to look bad weather square between the giant, wet snowflakes and say "Whatever, I'm wearing a great hat." you look fantastic!!!! 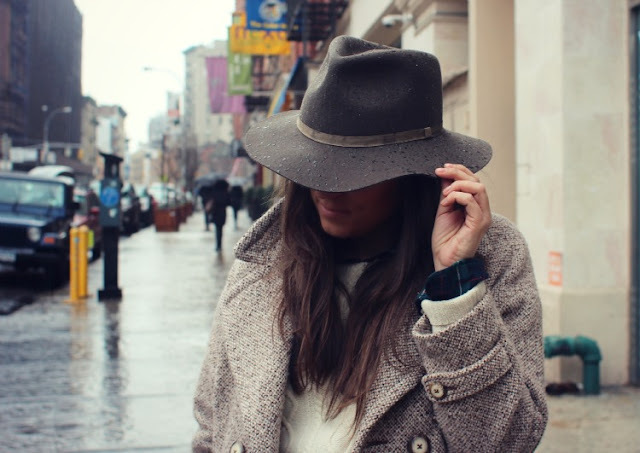 perfect outfit for rainy weather! lots of layers, a hat to protect the hair, and wellies to keep the toes dry!!!! Cute look! I'm obsessed with that flannel! I may just have to pick it up! Love the rustic slash sophisticated look! No one looks better in a stylish hat like this than you!